Skywatcher Victor Rogus snapped this view of the moon near Venus on Sept. 8, 2013 from Jadwin, Missouri. 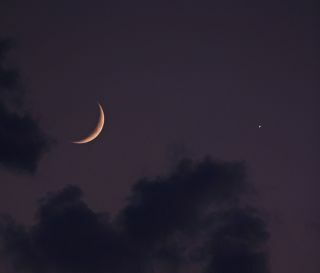 Venus and moon shared a dazzling celestial meet-up that wowed stargazers around the world Sunday evening (Sept. 8). Skywatchers snapped photos and at least one time-lapse video of Venus and the moon as the pair shined together in the night sky. "The sun set behind a veil of clouds, some of which reached the ground," skywatcher Victor Rogus of Jadwin, Mo., told SPACE.com in an email. "An eerie sound of the creatures of the night began to fill the air. A bit of a surreal and spooky setting as the moon began to make itself seen now with its friend, the planet Venus. A beautiful pairing of the two most romantic objects in the night sky. The two ducked in and out of the cloudy sky like a pair of shy lovers meeting in the dark." Photographer Mike Black of New Jersey captured amazing close-ups of the Venus and the moon as they set Sunday night. it was Black who created the time-lapse video of the two brilliant night sky objects. Ben Nevills captured this photo of the moon and Venus over Worthington, Indiana. He took the image with a Canon 40D and Canon 100-400 mm lens on Sept. 8. “The weather was very humid and a slight layer of clouds didn’t make for a very clear picture, but did add a little color,” Nevills wrote SPACE.com in an email. Some observers got a particularly special cosmic treat. From certain locations on Earth, the moon appeeared to hide Venus it passed between Earth and the more distant planet in what scientists call an "occultation." Although the unique sight couldn't be seen around the world, some stargazers in the Southern Hemisphere also got an incredible view of the conjunction. "It was an amazing show from the city of Taubate in Brazil," Paulo Crozariol said in an email. Paulo Crozariol sent SPACE.com this image of the moon and Venus over Taubate, Brazil on Sept. 8. “It was an amazing show,” Crozariol wrote SPACE.com in an email. He used a Panasonic HDC – TM 900 camera to take the photo. If weather prevented your viewing of the close conjunction, the moon and Venus will make another appearance together in a month on Oct. 8, although the pairing will be much wider at that time. You can also see Venus, the moon and Saturn in the night sky tonight (Sept. 9). While clouds blocked the sky for much of the day in State College, Penn., skywatcher Samuel Hartman was still able to photograph the close pairing. "I was able to take images of Venus near the moon," Hartman told SPACE.com via email. "Clouds had filled the sky for most of the day, but come sunset the clouds cleared revealing the moon and Venus setting in the west." Editor's note: If you snapped an amazing photo of the moon near Venus — or any other night sky sight — and would like to share it with SPACE.com for a possible story or photo gallery, please send images and comments, including name and equipment used, to managing editor Tariq Malik at: spacephotos@space.com.